The Kickapoo State Park field trip area is geographically located on the east side of the central portion of Illinois and geologically located along the northeastern rim of the Illinois Basin. Physiographically part of the Bloomington Ridged Plain, the area is dominated by the effects of the Wisconsin Glacial Episode. Stops along the field trip route include Slope Mine No. 6, Emerald Pond, and the Meadow Day Use Area, all in Kickapoo State Park; Middle Fork of the Vermilion River, Kennekuk County Park; the gob pile, Dering Coal Company; and Material Services Corp., Fairmount Quarry. 2010. 530 + xiv pp. Geology of Illinois has been compiled from more than a century of earth science investigations in Illinois. 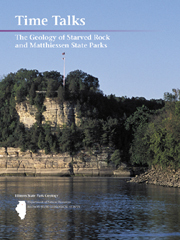 For the first time, this information has been summarized and made accessible in one volume to help both geologists and non-geologists better understand how the state’s mostly unseen geology affects, and is affected by, life on the surface. More than 200 color photographs, maps, and drawings illustrate the text. • the application of geological information to societal issues. Limited quantities of this comprehensive reference are available while they last. The volume is out of print. The guide is a valuable asset for both professional paleontologists and amateur collectors because the well-preserved fossils from the Mazon Creek area of northeastern Illinois provide the most complete known record of late Paleozoic life. The volume is a systematic account of the area’s diverse animal fossils, especially marine and freshwater fauna. Discussed are the area’s coal mining fossil collecting, the geologic and environmental setting, and fossil distribution. Individual chapters provide detailed information about the fossil groups represented at Mazon Creek. Illinois--a flat and boring state with nothing but cornfields and crowded expressways, right? Balderdash! Geology Underfoot in Illinois scratches the Prairie State's surface to expose geologic diversity that stretches back more than a billion years. 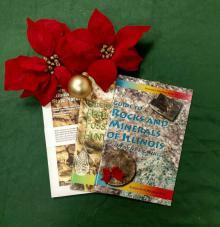 Copious illustrations and witty, page-turning prose guide readers on geologic walking or driving tours of 37 sites in Illinois. Enjoy an unexpected exploration of Chicago's architectural geology. Embark on a fault-seeking expedition in Mark Twain's big-river country. Or try moraine surfing on Interstates 55 and 74. With a touch of curiosity and Geology Underfoot in Illinois in hand, you will view the state with a new sense of wonder. Illinois State Park Geology Series. ISBN 978-0-615-82666-0. 2005. Full color. 48 pp. Come explore the natural beauty and wonder of the most visited state park in Illinois. Beautiful photographs, maps, and easy-to-read text will guide you through the geologic story of how the parks were formed and continue to change. This trailside view of the parks' geology is sure to give you renewed appreciation for the great rivers, bluffs, and canyons these parks contain. 2013. Full color. 42 pp. Shifting Sand, second in the Illinois State Park Geology series, tells the ever-changing story of Adeline Jay Geo-Karis Illinois Beach State Park. This story is one of thousands of years of geological and natural history illustrating the progress of glaciers, changing lake levels, shoreline migration, the building of park land, the Dead River meanderings, and the living beauty of the park’s plants and animals. Located on Chicagoland’s northeastern edge, Illinois Beach State Park is known for its unique coastal environment. Here in the midst of the heartland, gulls cry, waves slap the shore, and quartz sand pebbles sing in the wind. The undulating ridge-and-swale landscape, evidence of its wave-formed history, forms a graceful, curving pattern. Yet concerted efforts are required to maintain the park’s sand beaches and protect the landscape from human and industrial impacts for the benefit of future generations.